Once a small market with limited candidates, there are now many different paid icons sets available to designers and developers. The icons cater to web, app and mobile (iOS, Android) design. But how do you choose which one to fork out for? Well we have looked at some of the most popular paid icon sets and looked at which of them are the best value for your money. Cheap high quality icons, a nice free set and lots of formats. A smaller set than the Pro 3 (and thus a little more expensive – 13c/icon), but its still good value and high quality. 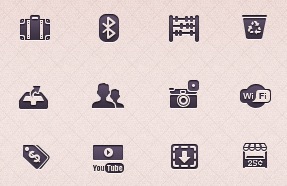 High quality, and great value, this is a nice icon set with extra toolbar icons included. Half the price (4c/icon) of the Glyphicon Pro set, but with less formats. This might be for you if you don’t require all the vector or font formats. IconSweets2 is the best value icon set on the list at only 1c per icon. At that price, its probably worth giving them a look. Iconic is the only completely free set available. The icons are high quality and a nice quantity so who can complain. At 6c/icon Ikonic is a nice set of icons, plus its only $9 to get all 150 so why not. By far the biggest icon set on the list, and at 4c/icon its actually pretty good value too. The icons might not be suitable if you want to resize them down though, as some are quite detailed. Pictos are the only company splitting out vectors from raster icons. Its around 15c/icon for the PNG pack. They also do not offer a free set so you can try out the quality of these icons. This brings down the value of the set down. These PNG icon sets is nearly 25c per icon, around 5x the price of the Glyphish icon set (and you get vectors and PNGs). This icon set also does not offer a free set. This icon set only offers PNGs, but there are a lot of sizes and it specifically caters for iOS and Android sizing which is nice. While no one will argue that the icons are high quality (and they are), they are also ridiculously expensive when compared to the other icons sets – at $1.13 per icon! At this price, I would suggest just using The Noun Project and buying the icons you really need at $1.99 per icon. Another very expensive icon set. Unless you have the dough to fork out, I would steer away from this set. Around $1.29 / icon making it the most expensive icon set on the list. I’d suggest a don’t buy unless you really need it. As all good combined packages should be, this package is cheaper than the individual prices. Still very pricey though at 83c/icon. The noun project has a large collection of icons. Each icon is individually priced, generally sitting at most around $1.99. However, lot of the icons are free with various creative commons licenses (attribution etc). If you are looking for a one off icon, this might be the site for you. Thats a lot of icons. So to do a quick summary, IconSweets2 is the best value set at 1c/icon or if you are looking for the creative commons route, try out Iconic. If you find any icon sets I’ve missed post them in the comments below and I’ll add them to the post.